Tickets are priced at £22.00 (advance) and £25.00 (on the door). back until the 29th of September, 2008. Russnak, plus Montana Verde VJ Visuals and AjantaMusic DJs. first time, at the gig. 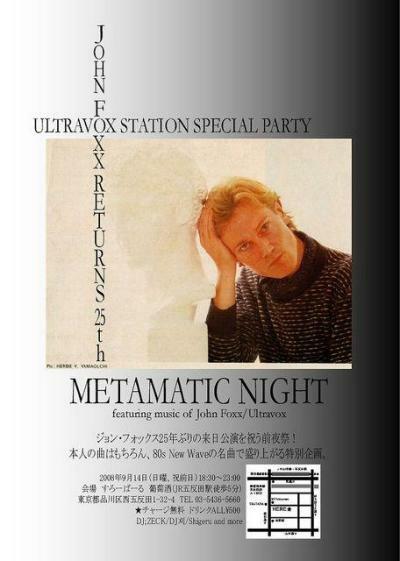 John Foxx & Louis Gordon : "Impossible"
closer to the live versions. Below is the full track-listing and catalogue number. John Foxx & Louis Gordon : "Neuro Video"
Luminaire in London on the 24th of November, 2007.
specific details just as soon as they've been confirmed. left over) once the live shows are finished. Monday the 15th of September, 2008. Dubterror mixes, playing old and new. Vinyl, canvases and video. No entry cost. Beer sponsored by Tiger Beer. lacquers of /1 and /1 only. between the 15th and 25th of November, 2008. Hand-painted on the flip. One for each "Burning Car" and "20th Century". to the 22nd of September, 2008. Executive Production by Karborn. Visuals by Karborn. especially for their forthcoming show at Cargo. Just to let you all know that the release date for the "Burning Car"
Garden", "The Golden Section" and "In Mysterious Ways". John Foxx : "The Garden"
Tracks 06, 09, 10 and 11 on Disc Two of "The Garden" are previously unreleased. "The Quiet Man 3" and "The Quiet Man 4" respectively. John Foxx : "The Golden Section"
John Foxx : "In Mysterious Ways"
(previously titled "Stairway" - B side of the "Enter the Angel"
"In Mysterious Ways" are previously unreleased. and £25.00 (on the door).